Driver of the car spoke exclusively to NBC10 Boston Monday night about the experience. 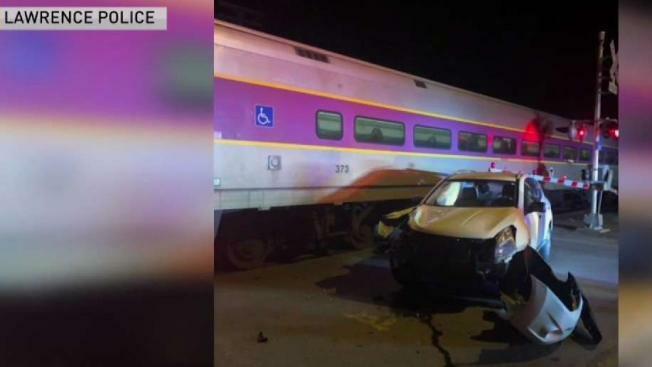 An MBTA Commuter Rail train collided with an SUV Monday night in Lawrence, Massachusetts. Lawrence police responded at 5:34 p.m. to the accident at the railroad crossing on Andover Street in South Lawrence. Jesus Rivera, who was driving the SUV, says he was heading home when he found himself stuck in traffic on the train tracks. "There was traffic on the road and I never thought the train would come in," he said. Rivera, who works for a demolition crew helping restore gas in the Merrimack Valley, was just trying to get home. He says he only had one choice when he saw the Commuter Rail train barreling down on him. "The arms started working out because the train was coming in and I can't go nowhere so, when I see that, coming over me, I just run away," he said. The Commuter Rail train smashed the front of his SUV with a force so hard that the airbags went off. The SUV is totaled. Transit police were at the Lawrence tow yard Monday night taking pictures of what was left. Rivera is clearly shaken up but is otherwise not injured. He knows just how fortunate he is to have escaped. "I'm lucky, I was lucky," he said. Following the accident, Haverhill Train 213 (4:30 p.m. from North Station) stopped and was 10-20 minutes behind schedule.